From hip, embroidered tunics to the lightest gowns — Peppermint Diva has a bit of everything. The boutique pays extra attention to the individual approach and one-to-one designer consultations to help you find the most gorgeous dress of your dreams. This bright and modern boutique done mostly in white is situated in the heart of the city near Forum Mall on Elgin Road. Simplicity and elegance are the key to the store run by designer duo Deepika Agarwal and Mita Jatia. 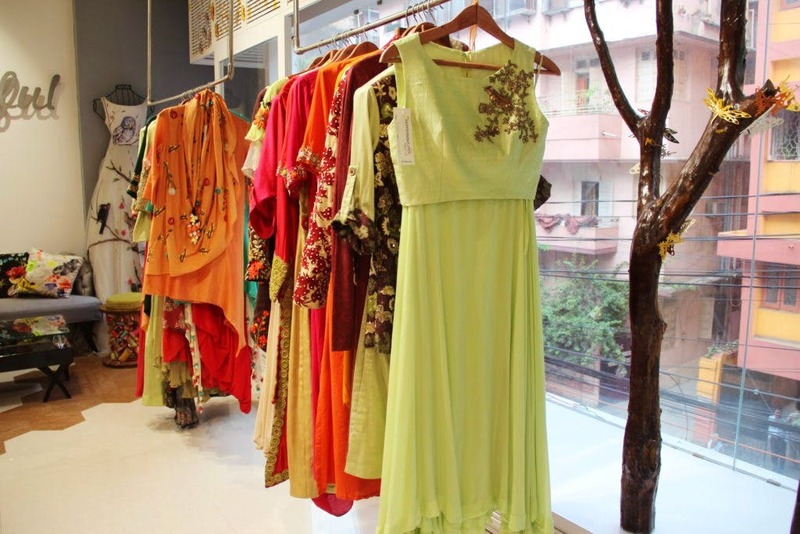 You will love trying out dresses in this bright and airy space, with floral motifs painted on doors, spools of colourful thread as panels on walls (and also in the moodas), and faux trees and branches in the display window. We loved the mannequin with angel wings and the elaborate sewing machine by the door — they all add to the charm of the space. They stock an amazing collection of bridal gowns ranging from beautifully classic to contemporary chic and everything in between. We loved the pale pastels with gold embellishments and subtle incorporation of sequins. Their range of embroidered tops, jackets and dresses are perfect for the honeymoon. They will tailor or tweak to match your perfect style, or you can start from scratch with a dress you like. The area is served by numerous restaurants and cafes, perfect for a touch of relaxation after a day of wedding dress shopping!